Last month, 24 big-name poker players were invited to the $20,000 buy-in Fox Sports Net (FSN) Tournament held at the Wynn Las Vegas hotel and casino. We started with four tables of six players each with the final six playing “live” on FSN. The day was ideal for this tourney, since no other major sporting event was scheduled — a rarity indeed. The 8:30 a.m. starting time. 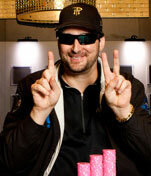 did not agree well with the players, who had just spent the month playing at noon for the World Series of Poker (WSOP). Further, we had to raise the blinds at a fast pace in order to eliminate players in time for the live part of the show. Still, no one complained — we knew what had to be done, and it was actually a fun event to play in! All of us would have rather been playing poker that day at the Rio instead the Wynn because that would have meant participating in day five of the WSOP, the top honor in poker with a $7.5-million first prize. In any case, this event at the Wynn was a nice second chance for all of us. I immediately began playing more hands than I normally would, trying to accumulate chips in the lower limits, knowing that the structure was conducive to gambling (playing more weak hands). As I mentioned, the structure also was conducive for super-fast play. In fact, the blinds were raised every 30 minutes! I began to hit some of these weak hands, and now, it seemed, I had everyone at the table a bit wary of me. They knew that I would call their raises with weak hands and that I was reading everyone at my table well; this seemed to scare most of them into playing tighter. After all, why mess with me when I had a lot of chips, I was reading them well, and I was playing hands simply trying to outplay them? Within 90 minutes we reached the final 18 players, and our table was broken down to make three tables of six apiece. I arrived at my new table in seat four with Daniel Negreanu in seat one, Johnny Chan in seat two, and T.J. Cloutier in seat three. Of course, all three are among the greatest players in the game right now. At this point, I had run my starting chips of $20,000 up to about $50,000 or so. Right away Negreanu and I got tangled up when I put him all-in for $6,700 with my 7-7 to his 9-9. Negreanu was a 4-1/2-to-1 favorite, and his hand held up. A couple of rounds later, with the blinds at $300-$600, I called with A-2. Three other players called, and the flop came down 8c-4d-3s. From the big blind Negreanu bet out $1,200 into the $2,400 pot, and I called, thinking an ace or a five would be awesome. The small blind called as well. The turn card was the 5d, making me a straight (5-4-3-2-A), and now Negreanu moved all-in for $14,900 into the $4,800 pot. After about 30 seconds (I didn’t want to call too quickly and scare off the player in the small blind), I called. Negreanu said, “It’s about time I hit one of these,” as he flipped up 8d-7d. He had top pair, as well as a straight draw and a flush draw. A quick check of my hand revealed a diamond, thus leaving Negreanu with eight diamonds and three sixes, or 11 outs. I had the other 33 outs and was a 3-to-1 favorite (33 to 11) to win the $34,600 pot. Alas, the last card was the 10d for Negreanu to make his flush, ouch! Another 15 minutes later, Negreanu and I got tangled up again when I moved most of my money into the pot with Ah-Jh before the flop, and he called with A-Q. At this point, he was a 2-1/2-to-1 favorite. The flop was 8h-8s-2h, and now I moved the rest in with my flush draw (the pot held over $30,000) and was called by Negreanu (I was now a slight favorite). After a turn card Qs, I was going to win only with a heart on the last card. Alas, the last card was a blank, and I threw my hand in and began to bemoan my bad luck!